My brother and I just returned from Guttenberg, Iowa. It is a nice, well-kept, old river town on the Mississippi. We've been going there for two or three days at a time for several years. It's perfect for a brief, relaxing, getaway on the Mississippi. 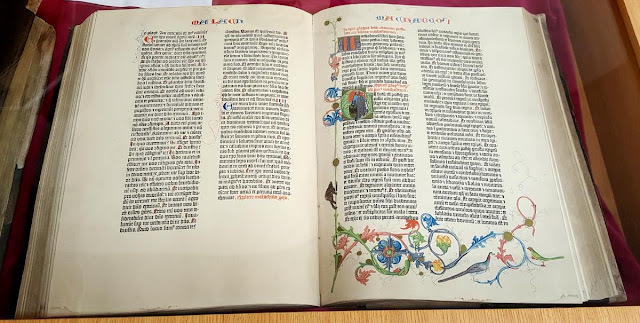 On display in the public library is a facsimile of the first full book printed with movable type: the Gutenberg Bible. The volume on display is not one of the Gutenberg originals (of which there are 46 copies still in existence). It is one of a two-volume set of an edition of 310 facsimile sets printed at Leipzig, Germany in 1913 by the Insel-Verlag, which using a copy of an original, reproduced it with modern printing methods. This facsimile copy of the Gutenberg Bible was on display in the Gutenberg print shop in Mainz during an air attack on Mainz on August 12, 1942, and as a result the covers and some pages along the edges of the volume were damaged by fire and water. However, it was decided not to rebind the book or to trim the burned portions, because it was felt that the survival of the book through the bombing was an important part of its history. No copy of the Gutenberg originals has been offered for sale for many years. Most are in the hands of large universities or libraries. The facsimile copies are also scattered throughout the world, and are considered rare books. A facsimile copy is on display at the Truman Library. President Truman used the book when he took the oath of office. A page image. Wikipedia on the Gutenberg Bible.